Auldbrass Plantation showcases the architectural genius of Frank Lloyd Wright. Photo: By New York World-Telegram and the Sun staff photographer: Al Ravenna [Public domain], via Wikimedia Commons. A true architectural treasure, listed on the National Register of Historic Places, is nestled in the backwoods of the South Carolina Lowcountry. Located just outside Yemassee and about an hour’s drive from Hilton Head, Auldbrass Plantation is the only Southern plantation designed by legendary architect Frank Lloyd Wright. 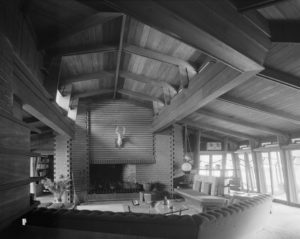 In 1939, builder C. Leigh Stevens called on Wright to design a self-sufficient, modern plantation for farming, hunting and entertaining. In keeping with his theories of organic architecture, Wright designed Auldbrass to exist in harmony with the Lowcountry landscape of which it is a part. Native cypress boards, laid diagonally at 80 degree angles, were used on the exterior of the buildings and on the fence that marks the property’s border. Wright is said to have calculated the average angle that a live oak tree leans and concluded that 80 degrees was the ideal natural form for the Auldbrass Plantation. Stevens owned Auldbrass until his death in 1962, when it passed on to his daughter, Jessica Steven Loring. After several subsequent owners, the plantation was purchased by major Hollywood producer Joel Silver, who is also a Frank Lloyd Wright aficionado, in 1987. Silver, who produced such blockbuster hits as “Die Hard” and “Beverly Hills Cop” enjoys vacationing and entertaining at Auldbrass Plantation whenever his schedule permits. In Hollywood, he lives in Wright’s legendary Storer House, built in 1924. 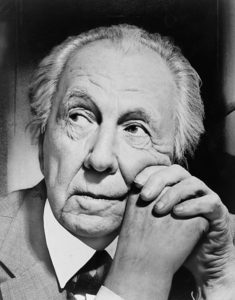 Working from Wright’s original plans and enlisting the help of Wright’s grandson, Eric Lloyd Wright, Silver completed the architectural vision for Auldbrass Plantation, thus fulfilling Wright’s and Stevens’ dream and making Auldbrass a true architectural treasure. Situated among tall oaks dripping with Spanish moss on the edge of a lush cypress swamp, this low-lying complex of eccentric pavilions, animal enclosures and outbuildings demonstrates how Wright could design architecture to suit any environment. He incorporated decorative motifs inspired by local flora into the design of the buildings. The abstract forms of ornamental rain spouts suggest hanging clusters of Spanish moss. Shades of rust and brown create a rustic effect at Auldbrass. Even the curbs of the paved paths that wind through the property are painted a rich rust color. Informal, rustic and rambling, the main house feels like a Frank Lloyd Wright hunting lodge. Today, the home features an elaborate media room and artifacts from Silver’s Hollywood days. As of 2018, the Beaufort Open Land Trust offers Auldbrass Tours every year. For more information, visit openlandtrust.org. Q: What is the population of Beaufort, SC? Q: What is Beaufort, SC known for? It is an historical city, founded in 1711. It has maintained its antebellum architecture and small town atmosphere. Many famous movies have been filmed here including Forrest Gump, The Prince of Tides and The Big Chill. Q: Are there vacation rentals in Beaufort, SC? Q: Where do you fly into for Beaufort, SC? You have 3 choices: Charleston, Hilton Head or Savannah. Q: Is Beaufort, SC and Island? Technically, yes. It is located on the island of Port Royal. Q: Is Beaufort, SC a good place to live? Beaufort always ranks as one of the best retirement cities in the United States and was named The Best Small Southern Town by Southern Living. Q: How far is it from Beaufort to Charleston, SC? Q: What are the best restaurants in Beaufort, SC? You definitely want to try Plums and the Saltus River Grill. Q: Where is the best shopping in Beaufort, SC? Q: When do the Azaleas bloom in Beaufort? Normally in March, but it could be sooner or later, depending on the temperature. Q: Is Beaufort, SC on the beach? No. It sits on the Atlantic Intercoastal Waterway. Q: Where can I stay in Beaufort, SC? There are both hotels ( City Loft, Best Western Sea Island) and bed and breakfasts( Rhett House, Beaufort Inn) in downtown Beaufort. Q: Where is Beaufort, South Carolina? Beaufort sits on the east coast of South Carolina, about halfway between Charleston to the north and Savannah Georgia to the south. It is also about a 30 minute drive to Hilton Head Island.